The first issue is ive been trying unsucessfully to get debugging working within a webstorm project when "Run with coffeescript plugin" is enabled. 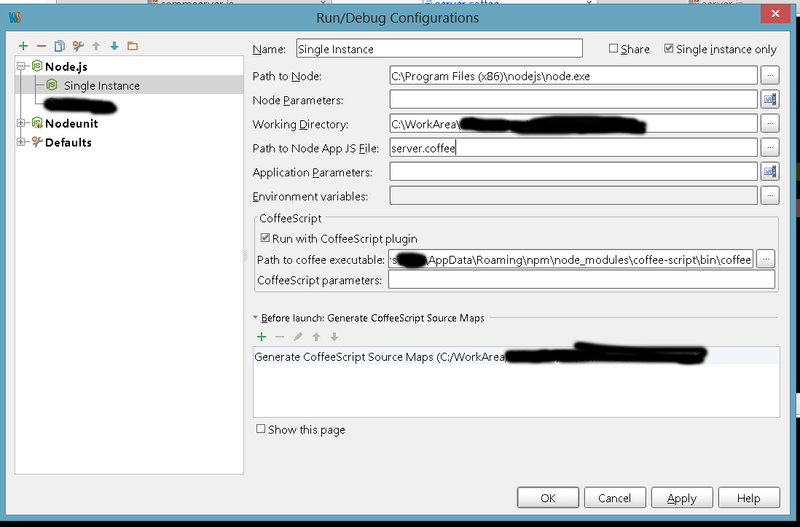 As soon as I check the "Run with coffee script option" within my configuration settings and set the appropriate "path to coffee script executable" my debug option under the run menu disables. Run is still available and works fine but ofcourse no break points get hit. There is my current configuration. The other problem is far simpler, when running my unit testing configuration my tests are being duplicated. It appears the coffee-script and the generated js files are both running (confirmed by deleting the js file, leaving just coffee file, and this worked correctly), is there any way to prevent the .js files from being executed. Its not a huge deal to have both run more of a minor inconvenience. Advised by support this a reported issue. If you will use CoffeeScript file watcher, generated js files will be excluded from completion and resolving. Maybe it will solve your problem with tests. Still experianced problems with duplicate tests using file watcher, as a simple solution i changed the output location of the js files (using the file watcher), little hacky but it works. Where are generated *.js files located? In the same directory with *.coffee or in a separate directory (for example, generated/)? Are there duplicated tests if you run your nodeunit tests from console? although in order to get the sourcepath macros working I had to mark both directories as test directories and I setup unit testing configurations to run either directory. Could you please provide more details about the problem. What "sourcepath macros" aren't working? Thanks.